Other Such Happenings: I <3 Faces - Crazy, Silly, Funny Face! I <3 Faces - Crazy, Silly, Funny Face! This is a much littler Noah on a trip to The Children's Museum. Every time I looked at him, I smiled. Okay, it was more like busted a gut! Hmmm... perhaps I should use this tactic with my boys on one of our not-so-great days? I think it would be impossible to be angry if you had to look at a face like that all day long! This is too cute and too funny! LOVE it! That is a great photo. I love pictures that just make me smile each time I look at them! Thanks for sharing. LOL! That's a great idea. Maybe I should try that too. :) Love you!!! Is that REAL marker? Smmmfft..smirk. Actually, it's face paint crayons. You dip them in water and then paint away! He really liked it at first-- but as the day went on, he began to hate it and would start getting mad whenever he saw his reflection. :snort: It's funny how certain moments get cemented in your memory. So fun! 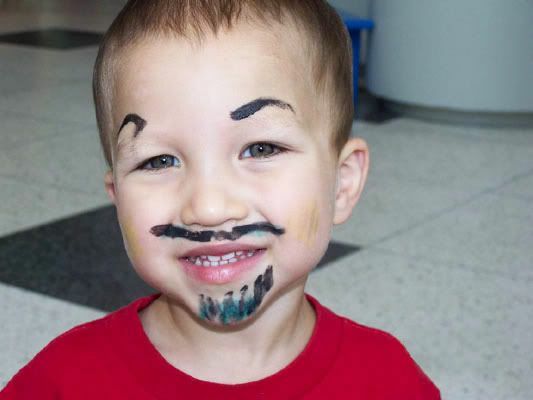 I'm gonna have to get some face paint crayons for my niece and nephews. Thanks for the idea. That's so cute! Hilarious! At first I thought you'd doodled on the picture and then I looked closer and realized he'd really marked himself. Too cute! Thanks for the comments :) I love your picture too! What a cutie! :) So fun. Great picture! Thanks for stopping by my post.. BTW - Tara did not like the octopus... kudos though for trying - I will not - she likes mushrooms, steamed clams, flounder, salmon, spinach and asparagus - so I guess not liking octopus is okay! Thanks for your comment on my blog! I love your entry. Too cute! Is there an entomologist in da hizouse?